Sandy Sedgwick, our speaker from the volunteer bush fire brigade other wise known as the NSW Rural Fire Service, telling us about the life of a firey. Highlighting the great importance of supporting our local Fire Service because they are the ones who are on call 24/7 to protect life and property. How fortunate we are to have such selfless people to put their lives on the line in our most difficult of times. Hats off to the fireys! "When I grow up I'm going to be a fireman" says Kerry. "Really?" says Gillian. "That hat suits you" says Lina. 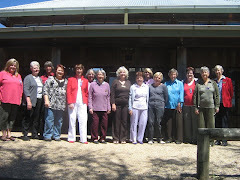 We had our first luncheon meeting at Logan's in Bungendore and what a meal was prepared by Dianne, the proprietor! A three course banquet was presented for members. See you next month Dianne. Love this month's photos and quotes. You are doing a great job keeping the blog up to date even in your busy schedule. Well done and keep up the good work Lydia.